“What I cherish most about my upbringing is the respect and compassion for others that my parents instilled in me,” Col. Maureen Weigl said. It was their example of dedication and commitment to their family, church, and local community that set Weigl on the path to devoting her life to helping others. It’s something this married mother of two has been passionate about since she began her military career. 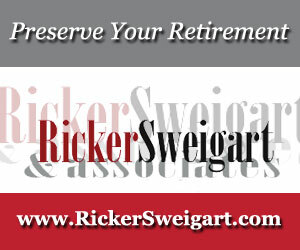 She contracted with Army ROTC and was commissioned as a distinguished military graduate and second lieutenant in 1993. 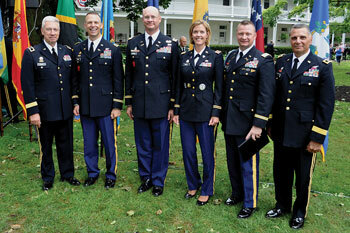 PAARNG Army War College graduates in 2012 with MG (ret) Craig and MG (ret) Marchi. “For the past 24 years, I have been active duty serving on regular active duty and Active Guard Reserve with the National Guard,” Weigl said with pride. Weigl served on active duty with the 10th Mountain Division before serving in the National Guard in New York and in Pennsylvania and at the National Guard Bureau in Washington, D.C.
“While on active duty in New York, I had the opportunity to be one of a handful of second lieutenants to deploy with the 10th Mountain Division on a peacekeeping mission to Haiti in support of Operation Uphold Democracy,” she recalled. It was her first experience with a third-world country, and although there were challenges, she found it to be a great learning experience. Weigl with COL (ret) David Sheridan in Baghdad, Iraq. 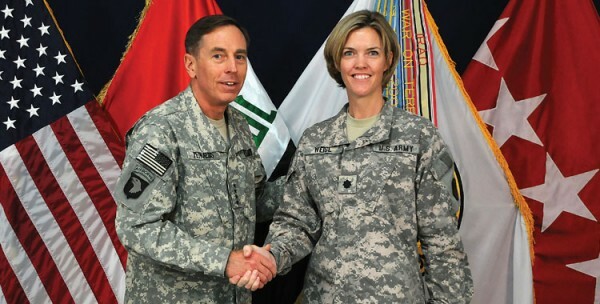 In 2008, by then a lieutenant colonel, Weigl was deployed to Iraq, where she was asked by the director of the Army National Guard to “conduct research on a method to document those service members who were exposed to rapid acceleration and/or concussive events … but who otherwise were not injured or visibly injured,” she said. Their mission was a result of the large number of personnel who returned from combat suffering traumatic brain injury symptoms but without any medical records to support their conditions. “We built a prototype, and I wrote the policy and implementation plan for the tracking of such data,” Weigl said. For the past eight years, Weigl has been working at the national level for the Army National Guard and the Department of the Army on suicide prevention, resiliency, sexual assault, recruiting and retention, and employment initiatives for soldiers and veterans. While attending a suicide prevention conference in 2011, Weigl met Dr. Barbara Van Dahlen, founder and CEO of Give an Hour (GAH), which is a nonprofit organization providing free mental-health services to U.S. military personal and families affected by the current conflicts in Iraq and Afghanistan. Weigl said the Army National Guard experienced the highest year of suicides in 2010. The Give an Hour program offers behavioral health specialists and psychologists the opportunity to give an hour of their time to counsel military service members, family members, and veterans at no cost to those needing the services. Not only is Weigl passionate about the mental health of those who serve our country, but she is also concerned about their physical health as well. 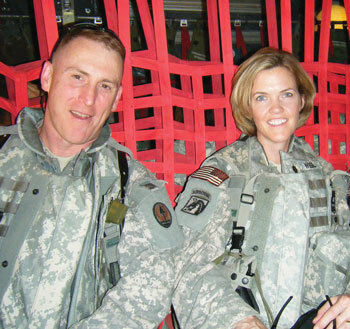 A lifelong athlete, Weigl recalls how, although she enjoyed running, she particularly enjoyed aerobics, and at her first duty station she became a certified instructor. She has volunteered and taught classes for service members at the Army National Guard Readiness Center, the Pentagon, and also while deployed in both Haiti and Iraq. Sadly, Weigl’s mother passed away recently from complications with heart failure. Weigl is grateful for the opportunities that her military career has provided and feels honored to work in cooperation with organizations and leaders in the community that are “truly passionate about caring for other service members,” she said. “When I joined the military 24 years ago, I did not believe that I would have made a career out of it. I also did not think that what would keep me engaged and passionate would be the ability, as a leader, to positively shape policies and legislation to improve the lives of service members, families, and veterans. Outreach programs like Give an Hour … have helped decrease the stigma for mental illness and has helped provide more access to care in every community,” Weigl noted. At the end of this month, Weigl will be retiring from the service but is not retiring from continuing to work helping those in the military. Weigl has decided to develop a website to document some of those struggles and also to offer amputees adjustable clothing from name-brand manufacturers and designers. Amputees struggle with something that many of us take for granted—functional and fashionable clothing. Weigl is partnering with a few companies now, and her website will serve as a “one-stop shop” for amputees to buy clothing that is adjustable for their needs without having to pay additional money for the tailoring. Another way she will continue to give back is by providing consulting services. “I worked on many employment initiatives while serving in the military and recently identified a gap in helping veterans transition into civilian careers,” Weigl said. She believes the problem lies in corporations not having good “onboarding” practices or with veterans who haven’t been thoroughly prepared for civilian careers. “I am helping to develop some training programs and webinars for corporations and small businesses with the Fearless Leaders Group and SOBALT Group,” Weigl said.